Mediterranean Pasta Salad is super fresh and just in time for summer! 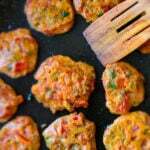 It is perfect for everyday meals and and potlucks. You can make it ahead of time. As it’s getting warmer, we are in need of chilled recipes that we can make for outdoor dinner parties or BBQ parties. This Mediterranean Pasta Salad is one of the greatest summer recipes that is ready in no time. Although summer is the perfect time for this salad, I make it all year round as a side dish to serve with meat dishes. It reminds us our summer holiday memories and we feel like summer never ends. Who doesn’t love pasta? It’s one of the best foods ever. You can create zillions of recipes with pasta. I’d prefer having it hot as in Cheesy Meatball Pasta Casserole if we were in winter. But I love well-chilled pasta salad on warmer days; and I love to try various combinations of flavors each time. This Mediterranean Pasta Salad is one of my favorites as it has my favorite ingredients: tomatoes, cucumber, red onion, feta cheese and olives. I LOVE to eat them together for breakfast. A combination of these make the best side dish as well. When you toss those foods together to make a pasta salad, I recommend that you prepare a Mediterranean flavored dressing. Whisk together olive oil, mashed garlic, vinegar, lemon juice and dried thyme to make the best pasta salad dressing ever. When the salad ingredients come together with this amazing dressing, you have this irresistible Mediterranean Pasta Salad. You can make it ahead of time and store in the refrigerator in an air tight container. It’s better to leave out the onions if you make it overnight. Otherwise, the salad might taste too oniony. Add the onions right before serving. If you don’t like the strong taste of onion in your pasta salad, you can soak it in salty water for about 5 minutes. Drain well and then add it into the salad, it will have a more subtle flavor this way. 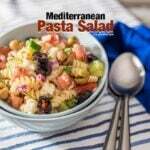 Pasta salad loaded with Mediterranean flavors. Cook the pasta according to the directions on the box. Drain and transfer into a large bowl. Toss in tomato, cucumber, onion, parsley, olives and feta. Give it a good stir. In a medium bowl, whisk together olive oil, mashed garlic, vinegar, lemon juice, thyme and salt. Pour it over pasta salad and stir well. Chill for at least 1 hour before serving.